AP Supplementary exams hall tickets 2018, AP SSC Exams ASE 2018 Hall tickets, AP Supplementary hall tickets: BSEAP Officials have uploaded SSC Advanced Supplementary Examinations June-2018 Hall Tickets on their Official website BSEAP.ORG. Candidates who were applied for Supplementary Examinations June 2018 stream, they can download their hall tickets from its official website. Candidates are requested to should read the instructions given on the hall ticket. Please keep hall ticket while entering examination hall. 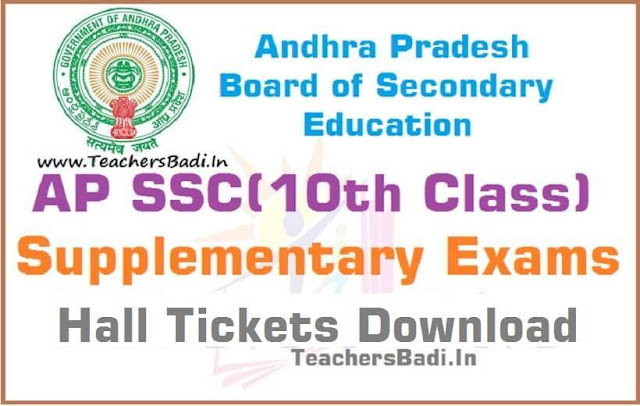 In this page also "SSC Advanced Supplementary June-2018 Hall Tickets Download" link and instructions are provided below. 2. Candidates shall not be permitted to write the examination without the Hall-Ticket. Candidates should present the Hall-Ticket for inspection whenever demanded during the examinations. 3. Candidates should write examination only in the subjects mentioned in the Hall-Ticket and should write the examination only in the medium indicated. 4. Candidates should take their respective seats in the examination halls at least 30 minutes before the commencement of the examination. 5. No candidate is allowed into the examination hall after 5 minutes of commencement of the examination. ii) Possessing papers, books, notes of any written material on body or clothing. iii) Receiving help from other candidates. v) Communicating, in any form with another candidate or any person other than the supervisory staff. vi) Consulting, notes, books in or outside the examination hall. vii) Assaulting, abusing or intimidating any person connected with the examination work at any time. viii) Causing disturbance in the examination hall during the examination hours. Step 1. First go to Official website www.baseap.org. Step 2. Click on "Download SSC ASE 2018 Hall Tickets" link. Step 3. Then another window will be opened. Step 7. Then, click on Download Hall Ticket Button.